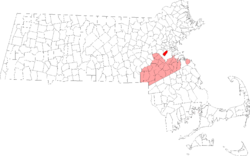 Brookline /ˈbrʊkˌlaɪn/ is a town in Norfolk County, Massachusetts, in the United States, and is a part of Greater Boston. Brookline borders six of Boston's neighborhoods: Brighton, Allston, Fenway–Kenmore, Mission Hill, Jamaica Plain, and West Roxbury. The city of Newton lies to the west of Brookline. At the 2010 census, the population of the town was 58,732. Brookline was first settled in 1638 as a hamlet in Boston, but was incorporated as a separate town in 1705. Brookline is especially notable as the birthplace and hometown of John F. Kennedy, 35th President of the United States. Brookline was known as the hamlet of Muddy River and was considered part of Boston until the Town of Brookline was independently incorporated in 1705. 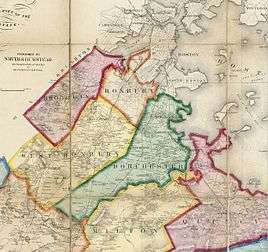 (The Muddy River was used as the Brookline-Boston border at incorporation.) It is said that the name derives from a farm therein once owned by Judge Samuel Sewall. According to the U.S. Census Bureau, Brookline has a total area of 6.8 sq mi (17.7 km2), all but 0.039 sq mi (0.1 km2) (0.44%) of which is land. In the town the population was spread out with 16.6% under the age of 18, 11.7%, from 18 to 24, 37.3% from 25 to 44, 21.9% from 45 to 64, and 12.4% who were 65 years of age or older. The median age was 34 years. For every 100 females there were 82.6 males. For every 100 females age 18 and over, there were 79.1 males. Serving as a residential zone for nearby academic and medical institutes such as Harvard Medical School and Boston University, the town of Brookline was reported as the city with the most doctoral degree holders (14.0% of total population) in the United States. The Town of Brighton was merged with Boston in 1874, and the Boston-Brookline border was redrawn to connect the new Back Bay neighborhood with Allston-Brighton. This created a narrow strip of land along the Charles River belonging to Boston, cutting Brookline off from the shoreline. It also put certain lands north of the Muddy River on the Boston side, including what are now Kenmore Square and Packard's Corner. The current northern border follows Commonwealth Avenue, and on the northeast, St. Mary's Street. When the Emerald Necklace of parks and parkways was designed for Boston by Frederick Law Olmsted in the 1890s, the Muddy River was integrated into the Riverway and Olmsted Park, creating parkland accessible by both Boston and Brookline residents. There are eight elementary schools in the Brookline Public School system: Baker School, Devotion, Driscoll, Heath, Lawrence, Lincoln, Pierce, and Runkle. As of December 2006, there were 6,089 K-12 students enrolled in the Brookline public schools. The system includes one early learning center, eight grades K-8 schools, and one comprehensive high school. The Old Lincoln School is a surplus building used by the town to temporarily teach students in when another school building is being renovated. It was rented in 2009 as the venue for the play Sleep No More. Brookline is governed by a representative (elected) town meeting, which is the legislative body of the town, and a five-person Board of Selectmen that serves as the executive branch of the town. For more details about the roles and procedures within the government of Brookline, please see the town government's own description at Brooklinema.gov. The town of Brookline is protected full-time by the 158 paid, professional firefighters of the Brookline Fire Department (BFD). It currently operates out of five fire stations located throughout the town, under the command of a Deputy Chief per shift. The BFD also operates a fire apparatus fleet of four engines, two ladders, one quint, one cross-staffed rescue (special operations), two squads, one special operations unit, one decontamination trailer, two maintenance units, as well as numerous other special, support, and reserve units. The Brookline Fire Department responds to approximately 6,500 emergency calls annually. The current Acting Chief of Department is Robert J. Ward. The Brookline Fire Department has four divisions of operation: Administration, Operations, Fire Prevention, and Training. The Administration Division is under the command of the Chief of Department and the Assistant Chief of Operations. The Operations Division is commanded by a Deputy Chief per shift, and includes the fire suppression units and personnel of the department, which include seven captains, 21 lieutenants, and 115 firefighters. The Fire Prevention Division falls under the jurisdiction of the Fire Marshal and includes all fire prevention, education, and investigative operations of the department. The Training Division is commanded by a Deputy Chief, a captain and a lieutenant. Below is a complete listing of all fire station company locations in the town of Brookline. The fire headquarters is at 350 Washington Street. Additionally, Fallon Emergency Medical Services, an ALS and BLS ambulance transport company, shares two of Brookline's firehouses with paramedic and EMT-staffed ambulances. The Greatest Game Ever Played (2005) takes place at The Country Club of Brookline, although the golf scenes were filmed in Canada. The Brookline Trunk by Louise Andrews Kent is a historical novel set in and around Brookline. It traces the history of Brookline from 1650 to 1955. Beacon Street in Brookline is the setting of the Beacon Street Girls, a series of children's books for pre-teen girls. Jonathan Coulton's song "Brookline" refers to the town. ↑ "Population and Housing Occupancy Status: 2010 – State – County Subdivision, 2010 Census Redistricting Data (Public Law 94-171) Summary File". U.S. Census Bureau. Retrieved 2011-07-03. ↑ Dudley, Dean (1871) (1871). Brookline, Jamaica Plain and West Roxbury Directory for 1871; Containing a General Directory of the Residents, Town Registers, Business Directory, Map, &c., &c. Boston: Dean Dudley & Co. pp. 15–16. The name of Brookline came, as the late Rev. Samuel Sewall (great grandson of Judge Samuel Sewall) conjectures, from one of the farms within its bounds, namely the Gates' farm, hired of Judge Sewall, which was probably called Brookline because Smelt-brook, running through it, formed the line between that and one of the neighboring farms, and this brook also separated that farm from Cambridge. Judge Sewall, in his journal, often mentions the name "Brookline" before the town was incorporated. Rev. Mr. S. also thinks it was Judge Sewall that suggested that name for the town. ↑ "1950 Census of Population" (PDF). 1: Number of Inhabitants. Bureau of the Census. 1952. Section 6, Pages 21–7 through 21-09, Massachusetts Table 4. Population of Urban Places of 10,000 or more from Earliest Census to 1920. Retrieved July 12, 2011. ↑ "2010-2012 American Community Surver 3-Year Estimates". 1: Total Population. American Community Survey. 2012. Retrieved April 19, 2014. ↑ Packard's Corner: Once and Future City Archived July 25, 2009, at the Wayback Machine. ↑ Arnold Arboretum Website Archived February 2, 2007, at the Wayback Machine. ↑ Brookline Village Archived October 8, 2007, at the Wayback Machine. ↑ |Berman Jewish Databank = <jewishdatabank.org= > Combined Jewish Philanthropies of Greater Boston (CJP), Berman Jewish Databank (2005). "Greater Boston 2005 Community Study". Berman Jewish Databank. Berman Jewish Databank. Retrieved 23 February 2014. ↑ "Metropolises" . Greek Orthodox Archdiocese of America. Retrieved on February 9, 2014. "162 Goddard Avenue, Brookline, MA 02445 "
↑ "The William Bowditch House". Retrieved September 12, 2007. ↑ "The Samuel Philbrick House". Retrieved September 12, 2007. ↑ "Brookline Town website: Neighborhood Associations". Brooklinema.gov. Retrieved 2011-12-31. ↑ "Public Library of Brookline website". Brooklinelibrary.org. Retrieved 2011-12-31. ↑ "Town Government". Brooklinema.gov. Retrieved 2011-12-31. ↑ "Archived copy". Archived from the original on January 7, 2014. Retrieved 2014-01-07. ↑ "Harvey Cushing: A Journey Through His Life: Marriage and Family". Yale Medical Historical Library. Retrieved 3 August 2015. Old USGS Maps of Brookline area. See 1903 west maps. Click (slowly and repeatedly) on bottom right of small map image for big map image if your MSIE resize is on. "Brookline Massachusetts, 1890". Retrieved February 26, 2013.